Blog | Jon Baas: "Walter Koenig Autograph - (TJBtH Trade #1)"
"Walter Koenig Autograph - (TJBtH Trade #1)"
Those who follow me on Facebook, Twitter or right here on my blog, know that I am working on a fun new "trade-up" project that will hopefully send me to an acting role in Hollywood. This is how it works: I started with a $1 million dollar bill. I traded that $1 million dollar bill to someone else, and they traded me something neat in return. Then I take that new object, and I trade it to someone else for a completely different neat and interesting object. This string of trades continues (for as long as it takes) until my final trade is made with a producer or director in Hollywood who chooses to trade me a small speaking role in a movie or television episode. My goal is to obtain a fun professional acting opportunity, but the journey to get there is told through the creative trades that fans, friends and others choose to make with me along the way! You can read more about my trading project here: "Trade Jon Baas to Hollywood" ("TJBtH"). As of right now -- today -- I've made my first trade. A friend in Utah, Rex, offered to trade me an autographed publicity photo of actor Walter Koenig (who played Ensign Pavel Chekov in the original "Star Trek" of the 1960's) in exchange for my $1 million dollar bill. 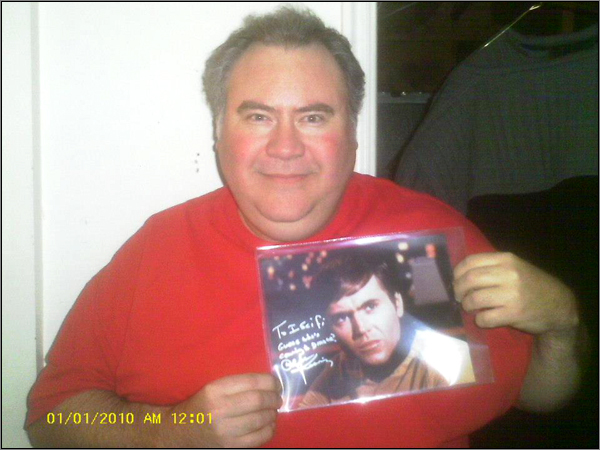 The photo is hand-signed by Walter Koenig himself. A number of years ago, Rex hosted a podcast known as I-SCI-FI. During that time, he interviewed many celebrities, production people and producers from Star Trek and other science fiction franchises. He still maintains contact with many of them today. 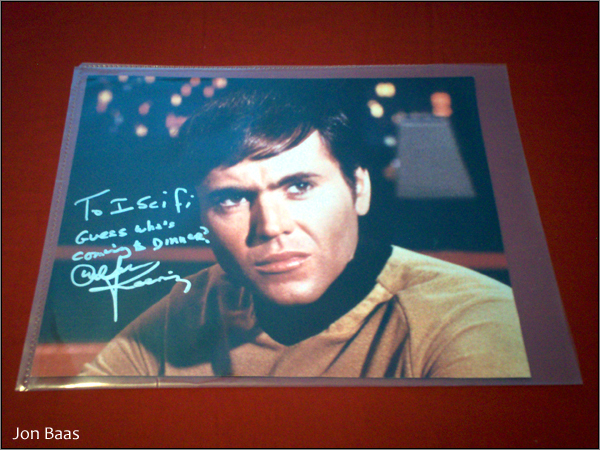 Walter Koenig was one of the celebrities he interviewed, and this autographed photo comes from that meeting. Today, Rex is a Mechanical Designer who has designed everything from Flight Simulators to rocket tooling for Shuttle boosters and other systems. He also writes science fiction, draws spaceships, and is a member of the Seventh Fleet Star Trek fan organization -- a group that promotes the dream of Star Trek through fan, friends, and family activities in the Utah area. Rex has also become a friend of mine through our interactions and shared interests on Facebook. I am deeply honored to have made my first trade with Rex, and humbled that he chose to trade me such a fascinating Star Trek item! Now that trade #1 has been made with Rex, if you like Star Trek, Walter Koenig, or wonderfully unique Star Trek memorabilia, this Walter Koenig autograph is available to trade to YOU. The photo is stored in a protective clear plastic sleeve, and is autographed with a silver Sharpie. The autographed text reads: "To I Sci fi, Guess who's coming to Dinner? Walter Koenig". So, who wants to trade me something bigger, better or more interesting than my Walter Koenig photo? Who wants to be the second trade in my bold "trade-up" journey to Hollywood? jonbaas@gmail.com. (I will only accept emailed trade requests at this email address). Alright, offer me something in trade. Let's see what happens in #2!